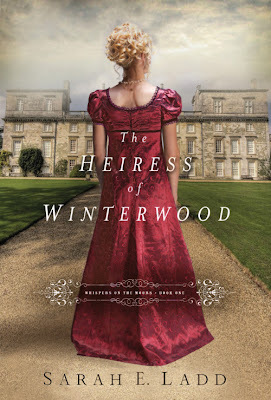 Thanks to Litfuse, I get to share Heiress of Winterwood by Sarah E. Ladd with you! Amelia Barrett gave her word. Keeping it could cost her everything. Amelia Barrett, heiress to an estate nestled in the English moors, defies family expectations and promises to raise her dying friend's baby. She'll risk everything to keep her word-even to the point of proposing to the child's father-a sea captain she's never met. Amelia's detailed plans would normally see her through any trial, but now, desperate and shaken, she's forced to examine her soul and face her one weakness: pride. Graham's strength and self-control have served him well and earned him much respect, but chasing perfection has kept him a prisoner of his own discipline. And away from the family he has sworn to love and protect. I really enjoyed this debut novel by Sarah E. Ladd. The regency style has really seemed to be coming to the forefront after the success of authors like Klassen. Heiress of Winterwood had all the right parts to make a readable and pleasurable, even if not always realistic, story: a loyal woman determined to keep her deathbed promise to her friend, despite the cost and embarrassment to herself; a young, widowed father determined never to marry again; a thwarted, thus vengeful, suitor; a fortune at stake; and an innocent child in the middle of it all. Add the unhappy extended family in there...along with the blossom of love, and you've got yourself a good book. I found Heiress of Winterwood to be a light and entertaining read. I would definitely read a future book by Sarah! Oh, and I loved the beautiful cover! That's what I thought, here's what other reviewers are saying. Thank you to Sarah and Thomas Nelson through Litfuse for sending me a copy to read and review! Today, I'm sharing with you Though My Heart is Torn by Joanne Bischof. When I was a young girl, a pastor at my school said something that has stuck with me ever since – I even had a copy hanging on my bedroom wall during those 'peer pressure' years: It is always HARDER to do what is right, but it is always RIGHT to do what is right. That's what I kept thinking throughout Though My Heart is Torn. Wow, I'm not even sure how to describe the book. It took me only a day to read, because I couldn't put it down (great writing! ), but when I finished, I felt unsettled. I could hardly wrap my head around all the regret and struggle throughout the book. I never expected to feel sorry for Cassie, but I did. I fought tears through almost the entire book! You'll want to read book one, Be Still My Soul, before starting this one. Be Still My Soul ends with Lonnie and Gideon repairing the rocky start to their marriage, and all seems well. Unfortunately, Though My Heart is Torn starts right out with an awful revelation – Gideon was married before...and still is, according to the law. Oh, what a tangled web we weave...! Gideon's past mistakes now haunt him and hurt everyone he loves. Though My Heart is Torn isn't a happy story. I struggled with the rights and wrongs of the story. What I wanted to happen, just couldn't...and what I didn't want to occur seemed to be transpiring by the end of the book. I didn't feel that hearts were mended by the final chapter, nor did I feel a satisfactory conclusion. And, book 3 won't be released until October 2013! I really don't know what to say! 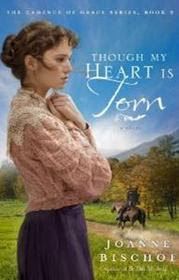 Though My Heart is Torn is the perfect title for this book...and my review! The story is definitely an emotion tugger and will make you think. The choices you make are never yours alone. While God will certainly forgive your past, the consequences, good or bad, will effect those around you, so be very, very careful in your actions! Please take a moment to rank my review for Blogging for Books! I would appreciate it! You can read an excerpt from Though My Heart is Torn HERE. Thank you to Joanne and Waterbrook Multnomah's Blogging for Books program for sending me a copy to read and review!